Your dinner does not need to be "gourmet" to be good. It just need to have elements you enjoy and give you pleasure while preparing it! 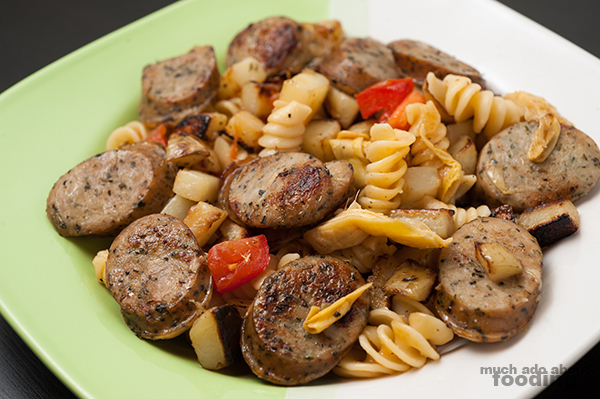 This potato and sausage rigatoni takes a step a little out of some people's comfort zone by adding potato to pasta. I, however, made sure that these were small dices and crisped on every side, giving an interesting texture to the whole dish. Of course, the sausage was the star of the pasta because it was a basil pepper type but you can choose your hero yourself. This recipe is an easy way to find a balance with different food groups and make something delicious in practically no time at all! Prep work might be the most tedious here. You want small dices for quicker cooking and more manageable balance. Scrub potatoes well and dice. Start a large pan with olive oil on medium heat - add potatoes and let crisp on every side. In a separate pot, prepare pasta (or you can pre-soak ahead of time). Add 1 Tbsp garlic salt and the oregano to potatoes. Slice and dice tomatoes and artichoke hearts into a separate bowl. I worked with pre-cooked sausage so your cooking time will vary depending on if you need to cook it ahead of time or not. I placed the slices into a pan to brown on each side. 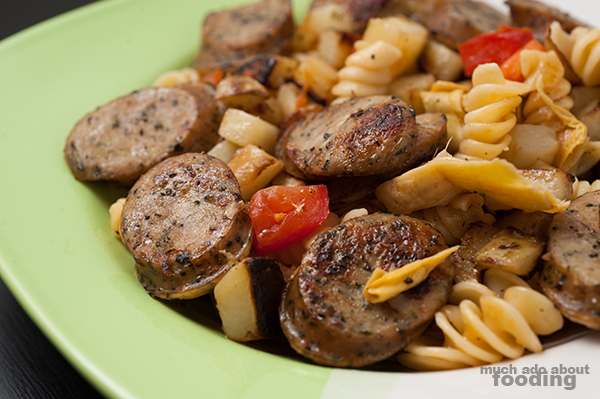 With pasta, mix in tomatoes, artichoke hearts, rosemary, lime olive oil, and black pepper. Mix thoroughly. Combine all ingredients together. Enjoy!